Please complete the form below by registering your name and the number of runners/walkers in your household that will be joining you. While there is no actual fee to participate in the Fun Run, we are asking that participants choose a donation below and/or purchase raffle tickets. Thank you so much for your support and we look forward to seeing you on Saturday at 7 am! Thanks for donating! Just check in at the Registration table on Saturday morning! We will see you then! A $50 donation allows BRAWS to purchase 1 Sports Bra and 2 XL Boxes of Pads/Tampons. A $75 donation for the Fun Run supports BRAWS and allows us to purchase 3 High Quality Sports Bras. Thanks so much for donating! Just check in at the Registration table on Saturday morning! See you then! Don't see the amount you would like to contribute? Please visit our DONATION PAGE, click on the yellow "Donate" button, and then type in the amount of your choosing! Thanks so much for your support! Every little bit make a big impact! ​can also be purchase at the event. 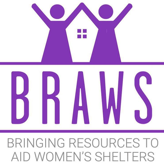 BRAWS is a 501c3 organization & your donations are tax deductible. Federal Tax ID: 47-3961191.